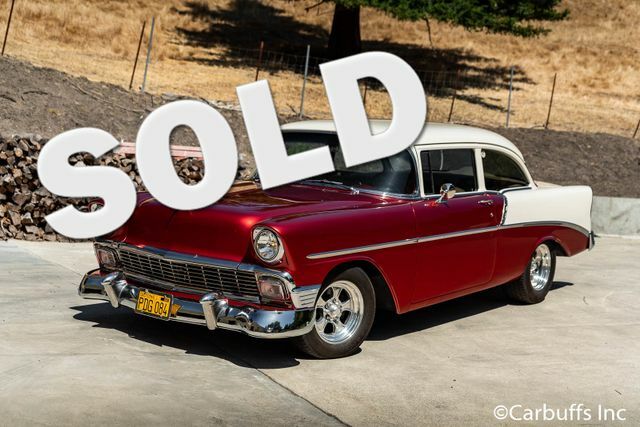 This incredible Chevy was bought by the current owner in 1985 from the Brown family (original owners) in Richmond, California. He kept the car around in stock form for awhile before beginning a full rotisserie frame off build to make the car drive and perform like a more modern car. Exterior was painted Art Himsl red/pearl white. All chrome and stainless redone. Tinted glass throughout. Very straight body to begin with. Definitely show quality. Interior has been done in a high grade soft touch vinyl. Custom guage bezel with Autometer guages. Interior was lined with Lizard skin insulation plus added Dynamat to handle sound and heat. Pioneer USB/flash drive/CD stereo in trunk with control in the cabin. Flaming River stainless steel tilt steering column. Rain Gear wiper motor and controls. Vintage Air heat and air conditioning. Power front windows. Custom 3rd stoplight. Cruise control. A 350 engine was installed to improve performance and a 700R4 overdrive automatic transmission to improve drivability. The engine has an aluminum intake and Edelbrock 4 bbl carburetor. Walker radiator and A/C condensor. Battery has been relocated to the trunk with a disconnect. Front suspesion was rebuilt with new ball joints, bushings, front and rear springs, sway bar and KYB shocks. 4 wheel power disc brakes. 9″ Ford posi rear with 3:50 gears. Power rack and pinion steering. Stainless steel bolts used throughout. Incredible driving 56 with only 12k miles on the build. Gorgeous original Nothern California car. Ready to go!